Insert a few lines of code in your application to find out what users are doing with it, or to help diagnose issues. You can send telemetry from device and desktop apps, web clients, and web servers. Use the Azure Application Insights core telemetry API to send custom events and metrics, and your own versions of standard telemetry. This API is the same API that the standard Application Insights data collectors use. TrackMetric() is no longer the preferred method of sending custom metrics for your .NET based applications. In version 2.60-beta 3 of the Application Insights .NET SDK a new method, TelemetryClient.GetMetric() was introduced. As of the Application Insights .NET SDK version 2.72 this functionality is now part of the stable release. The core API is uniform across all platforms, apart from a few variations like GetMetric(.NET only). TrackPageView Pages, screens, blades, or forms. TrackEvent User actions and other events. Used to track user behavior or to monitor performance. GetMetric Zero and multi-dimensional metrics, centrally configured aggregation, C# only. TrackMetric Performance measurements such as queue lengths not related to specific events. TrackException Logging exceptions for diagnosis. Trace where they occur in relation to other events and examine stack traces. TrackRequest Logging the frequency and duration of server requests for performance analysis. TrackTrace Diagnostic log messages. You can also capture third-party logs. TrackDependency Logging the duration and frequency of calls to external components that your app depends on. You can attach properties and metrics to most of these telemetry calls. For ASP.NET and Java projects, incoming HTTP Requests are automatically captured. You might want to create additional instances of TelemetryClient for other module of your app. For instance, you may have one TelemetryClient instance in your middleware class to report business logic events. You can set properties such as UserId and DeviceId to identify the machine. This information is attached to all events that the instance sends. In Node.js projects, you can use new applicationInsights.TelemetryClient(instrumentationKey?) to create a new instance, but this is recommended only for scenarios that require isolated configuration from the singleton defaultClient. Insert TrackEvent calls in your code to count various events. How often users choose a particular feature, how often they achieve particular goals, or maybe how often they make particular types of mistakes. The telemetry is available in the customEvents table in Application Insights Analytics. Each row represents a call to trackEvent(..) in your app. If sampling is in operation, the itemCount property shows a value greater than 1. For example itemCount==10 means that of 10 calls to trackEvent(), the sampling process only transmitted one of them. To get a correct count of custom events, you should use therefore use code such as customEvents | summarize sum(itemCount). /// Most simple cases are one-liners. /// This is all possible without even importing an additional namespace. // Recall how you send custom telemetry with Application Insights in other cases, e.g. Events. // The following will result in an EventTelemetry object to be sent to the cloud right away. // Metrics work very similar. However, the value is not sent right away. // It is aggregated with other values for the same metric, and the resulting summary (aka "aggregate" is sent automatically every minute. // The above example shows a zero-dimensional metric. // Metrics can also be multi-dimensional. // In the initial version we are supporting up to 2 dimensions, and we will add support for more in the future as needed. // The values for Pigs and Horses will be aggregated separately from each other and will result in two distinct aggregates. // You can control the maximum number of number data series per metric (and thus your resource usage and cost). // The default limits are no more than 1000 total data series per metric, and no more than 100 different values per dimension. // We discuss elsewhere how to change them. // We use a common .NET pattern: TryXxx(..) to make sure that the limits are observed. // If the limits are already reached, Metric.TrackValue(..) will return False and the value will not be tracked. Otherwise it will return True. Microsoft.ApplicationInsights.TelemetryClient.TrackMetric is deprecated in the .NET SDK. Metrics should always be pre-aggregated across a time period before being sent. Use one of the GetMetric(..) overloads to get a metric object for accessing SDK pre-aggregation capabilities. If you are implementing your own pre-aggregation logic, you can use the Track(ITelemetry metricTelemetry) method to send the resulting aggregates. If your application requires sending a separate telemetry item at every occasion without aggregation across time, you likely have a use case for event telemetry; see TelemetryClient.TrackEvent (Microsoft.ApplicationInsights.DataContracts.EventTelemetry). Application Insights can chart metrics that are not attached to particular events. For example, you could monitor a queue length at regular intervals. With metrics, the individual measurements are of less interest than the variations and trends, and so statistical charts are useful. Single value. Every time you perform a measurement in your application, you send the corresponding value to Application Insights. For example, assume that you have a metric describing the number of items in a container. During a particular time period, you first put three items into the container and then you remove two items. Accordingly, you would call TrackMetric twice: first passing the value 3 and then the value -2. Application Insights stores both values on your behalf. Aggregation. When working with metrics, every single measurement is rarely of interest. Instead a summary of what happened during a particular time period is important. Such a summary is called aggregation. In the above example, the aggregate metric sum for that time period is 1 and the count of the metric values is 2. When using the aggregation approach, you only invoke TrackMetric once per time period and send the aggregate values. This is the recommended approach since it can significantly reduce the cost and performance overhead by sending fewer data points to Application Insights, while still collecting all relevant information. The telemetry is available in the customMetrics table in Application Insights Analytics. Each row represents a call to trackMetric(..) in your app. valueSum - This is the sum of the measurements. To get the mean value, divide by valueCount. valueCount - The number of measurements that were aggregated into this trackMetric(..) call. In a device or webpage app, page view telemetry is sent by default when each screen or page is loaded. But you can change that to track page views at additional or different times. For example, in an app that displays tabs or blades, you might want to track a page whenever the user opens a new blade. User and session data is sent as properties along with page views, so the user and session charts come alive when there is page view telemetry. By default, the times reported as Page view load time are measured from when the browser sends the request, until the browser's page load event is called. Set an explicit duration in the trackPageView call: appInsights.trackPageView("tab1", null, null, null, durationInMilliseconds);. Use the page view timing calls startTrackPage and stopTrackPage. The name that you use as the first parameter associates the start and stop calls. It defaults to the current page name. The resulting page load durations displayed in Metrics Explorer are derived from the interval between the start and stop calls. It's up to you what interval you actually time. The server SDK uses TrackRequest to log HTTP requests. You can also call it yourself if you want to simulate requests in a context where you don't have the web service module running. However, the recommended way to send request telemetry is where the request acts as an operation context. You can correlate telemetry items together by associating them with operation context. The standard request-tracking module does this for exceptions and other events that are sent while an HTTP request is being processed. In Search and Analytics, you can easily find any events associated with the request using its operation ID. See Telemetry correlation in Application Insights for more details on correlation. // Telemetry sent in here will use the same operation ID.
} // When operation is disposed, telemetry item is sent. Along with setting an operation context, StartOperation creates a telemetry item of the type that you specify. It sends the telemetry item when you dispose the operation, or if you explicitly call StopOperation. If you use RequestTelemetry as the telemetry type, its duration is set to the timed interval between start and stop. Telemetry items reported within a scope of operation become 'children' of such operation. Operation contexts could be nested. See Track custom operations with Application Insights .NET SDK for more information on custom operations tracking. In Application Insights Analytics, requests show up in the requests table. To count them, as an indication of the frequency of a problem. The reports include the stack traces. The SDKs catch many exceptions automatically, so you don't always have to call TrackException explicitly. ASP.NET: Write code to catch exceptions. Java EE: Exceptions are caught automatically. In Application Insights Analytics, exceptions show up in the exceptions table. Use TrackTrace to help diagnose problems by sending a "breadcrumb trail" to Application Insights. You can send chunks of diagnostic data and inspect them in Diagnostic Search. In .NET Log adapters use this API to send third-party logs to the portal. In Java for Standard loggers like Log4J, Logback use Application Insights Log4j or Logback Appenders to send third-party logs to the portal. Log a diagnostic event such as entering or leaving a method. message Diagnostic data. Can be much longer than a name. properties Map of string to string: Additional data used to filter exceptions in the portal. Defaults to empty. You can search on message content, but (unlike property values) you can't filter on it. The size limit on message is much higher than the limit on properties. An advantage of TrackTrace is that you can put relatively long data in the message. For example, you can encode POST data there. In Search, you can then easily filter out all the messages of a particular severity level that relate to a particular database. In Application Insights Analytics, calls to TrackTrace show up in the traces table. If sampling is in operation, the itemCount property shows a value greater than 1. For example itemCount==10 means that of 10 calls to trackTrace(), the sampling process only transmitted one of them. To get a correct count of trace calls, you should use therefore code such as traces | summarize sum(itemCount). Use the TrackDependency call to track the response times and success rates of calls to an external piece of code. The results appear in the dependency charts in the portal. Remember that the server SDKs include a dependency module that discovers and tracks certain dependency calls automatically--for example, to databases and REST APIs. You have to install an agent on your server to make the module work. In Java, certain dependency calls can be automatically tracked using Java Agent. You use this call if you want to track calls that the automated tracking doesn't catch, or if you don't want to install the agent. To turn off the standard dependency-tracking module in C#, edit ApplicationInsights.config and delete the reference to DependencyCollector.DependencyTrackingTelemetryModule. In Java, please do not install java agent if you do not want to collect standard dependencies automatically. In Application Insights Analytics, trackDependency calls show up in the dependencies table. Normally, the SDK sends data at times chosen to minimize the impact on the user. However, in some cases, you might want to flush the buffer--for example, if you are using the SDK in an application that shuts down. // Allow some time for flushing before shutdown. The function is asynchronous for the server telemetry channel. Ideally, flush() method should be used in the shutdown activity of the Application. In a web app, users are (by default) identified by cookies. A user might be counted more than once if they access your app from a different machine or browser, or if they delete cookies. // Called when my app has identified the user. It isn't necessary to use the user's actual sign-in name. It only has to be an ID that is unique to that user. It must not include spaces or any of the characters ,;=|. The user ID is also set in a session cookie and sent to the server. If the server SDK is installed, the authenticated user ID is sent as part of the context properties of both client and server telemetry. You can then filter and search on it. If your app groups users into accounts, you can also pass an identifier for the account (with the same character restrictions). In Metrics Explorer, you can create a chart that counts Users, Authenticated, and User accounts. You can also search for client data points with specific user names and accounts. You can attach properties and measurements to your events (and also to metrics, page views, exceptions, and other telemetry data). Properties are string values that you can use to filter your telemetry in the usage reports. For example, if your app provides several games, you can attach the name of the game to each event so that you can see which games are more popular. Metrics are numeric values that can be presented graphically. For example, you might want to see if there's a gradual increase in the scores that your gamers achieve. The graphs can be segmented by the properties that are sent with the event, so that you can get separate or stacked graphs for different games. For metric values to be correctly displayed, they should be greater than or equal to 0. There are some limits on the number of properties, property values, and metrics that you can use. Take care not to log personally identifiable information in properties. Don't reuse the same telemetry item instance (event in this example) to call Track*() multiple times. This may cause telemetry to be sent with incorrect configuration. In Analytics, custom metrics and properties show in the customMeasurements and customDimensions attributes of each telemetry record. When you extract a value from the customDimensions or customMeasurements JSON, it has dynamic type, and so you must cast it tostring or todouble. To take account of the possibility of sampling, you should use sum(itemCount), not count(). Sometimes you want to chart how long it takes to perform an action. For example, you might want to know how long users take to consider choices in a game. You can use the measurement parameter for this. If you want to set default property values for some of the custom events that you write, you can set them in a TelemetryClient instance. They are attached to every telemetry item that's sent from that client. Individual telemetry calls can override the default values in their property dictionaries. To add properties to all telemetry, including the data from standard collection modules, implement ITelemetryInitializer. You can write code to process your telemetry before it's sent from the SDK. The processing includes data that's sent from the standard telemetry modules, such as HTTP request collection and dependency collection. Add properties to telemetry by implementing ITelemetryInitializer. For example, you can add version numbers or values that are calculated from other properties. Filtering can modify or discard telemetry before it's sent from the SDK by implementing ITelemetryProcessor. You control what is sent or discarded, but you have to account for the effect on your metrics. Depending on how you discard items, you might lose the ability to navigate between related items. Sampling is a packaged solution to reduce the volume of data that's sent from your app to the portal. It does so without affecting the displayed metrics. And it does so without affecting your ability to diagnose problems by navigating between related items such as exceptions, requests, and page views. To disable selected standard collectors--for example, performance counters, HTTP requests, or dependencies--delete or comment out the relevant lines in ApplicationInsights.config. You can do this, for example, if you want to send your own TrackRequest data. During debugging, it's useful to have your telemetry expedited through the pipeline so that you can see results immediately. You also get additional messages that help you trace any problems with the telemetry. Switch it off in production, because it may slow down your app. For Node.js, you can enable developer mode by enabling internal logging via setInternalLogging and setting maxBatchSize to 0, which causes your telemetry to be sent as soon as it is collected. To avoid mixing up telemetry from development, test, and production environments, you can create separate Application Insights resources and change their keys, depending on the environment. If you set any of these values yourself, consider removing the relevant line from ApplicationInsights.config, so that your values and the standard values don't get confused. Component: The app and its version. 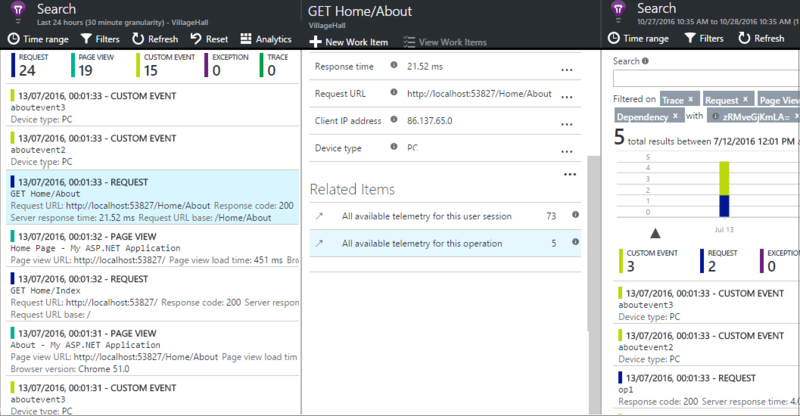 InstrumentationKey: The Application Insights resource in Azure where the telemetry appears. It's usually picked up from ApplicationInsights.config. Location: The geographic location of the device. Operation: In web apps, the current HTTP request. In other app types, you can set this to group events together. ID: A generated value that correlates different events, so that when you inspect any event in Diagnostic Search, you can find related items. Name: An identifier, usually the URL of the HTTP request. SyntheticSource: If not null or empty, a string that indicates that the source of the request has been identified as a robot or web test. By default, it is excluded from calculations in Metrics Explorer. Properties: Properties that are sent with all telemetry data. It can be overridden in individual Track* calls. Session: The user's session. The ID is set to a generated value, which is changed when the user has not been active for a while. There are some limits on the number of metrics and events per application, that is, per instrumentation key. Limits depend on the pricing plan that you choose. Total data per day 100 GB You can reduce data by setting a cap. If you need more data, you can increase the limit in the portal, up to 1,000 GB. For capacities greater than 1,000 GB, send email to AIDataCap@microsoft.com. Throttling 32,000 events/second The limit is measured over a minute. Data retention 90 days This resource is for Search, Analytics, and Metrics Explorer. Availability multi-step test detailed results retention 90 days This resource provides detailed results of each step. Property and metric name length 150 See type schemas. Property value string length 8,192 See type schemas. Trace and exception message length 32,768 See type schemas. For more information, see About pricing and quotas in Application Insights. To avoid hitting the data rate limit, use sampling. To determine how long data is kept, see Data retention and privacy. What exceptions might Track_() calls throw? None. You don't need to wrap them in try-catch clauses. If the SDK encounters problems, it will log messages in the debug console output and--if the messages get through--in Diagnostic Search. Is there a REST API to get data from the portal? Yes, the data access API. Other ways to extract data include export from Analytics to Power BI and continuous export.